Manufactured to Swiss level quality, precision and standards, JUUK's premium Apple Watch bands are the only choice for extremely well-made, uniquely-designed steel bands for your Apple Watch. We use only solid 316L stainless steel in the band links and deployment buckles. Instead of cheap push pins where you'd need to take it to the watch shop for adjustment, we opted for precision steel screws for easier link removal (we even include a custom screwdriver so that you can do it right out of the box yourself). The connectors are custom designed and developed to perfectly fit the Apple Watch, as well as seamlessly integrate into each band's unique design. We go to great lengths to refine the smallest details. 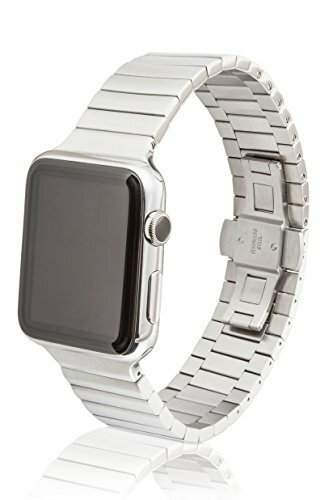 In our satin brushed versions, for example, the sides of the bracelet are polished instead to better match the steel Apple Watch when viewed from the side. This attention to detail is even extended to the pushers on the buckle, where only the outside edges are polished on the brushed buckle. This Revo band uses 2-piece links, which means for every link, it takes 2 separate components to make it. This creates 2 pivot points in each link for added flexibility, so this band is very flexible while at the same time minimises the gaps you'll see between the links. The Revo's links alone are actually comprised of 64 separate components (not including the buckle, pins and screws)! These seemingly small details all add up to a very luxurious experience to meet our goal of transforming the Apple Watch from a cool tech gadget to use into a timepiece you'll love to wear. We achieve this through strict quality acceptance standards and just as importantly, we partner with factories that also manufacture for major Swiss brands. We come from the watch industry, so this is all we know, but we know it very well. Read our reviews online and you'll see what we mean!